This Grobag comes in a Scandi inspired illustrated bears cuddle around your little one, in a calming palette of colours. 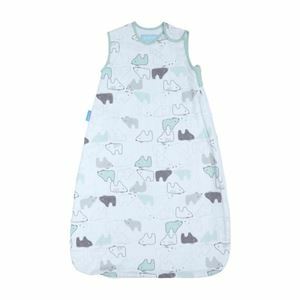 Lightweave is a new 100% cotton fabric, designed to keep your baby cool and provide all the natural air ventilation and the softness of a muslin product, without shrinking or losing its shape like muslin can. It is available in 1 warmth ratings called Tog to make sure that your baby is sleepig at the right temperature inside the grobag. The factors that determine the tog rating of the bag depend upon the number of clothes that the baby is wearing, room temperature and baby's health. The nursery thermometer (included) can be used to pick the correct tog.